Lluvica highlands quinoa farmer, Miguelina in her fields overlooking the salt flats. After weeks of trekking through the high salt flat plains, volcanic perimeters and mountain corridors, visiting over a dozen remote quinoa communities – Puerto Lluvica, Lluvica, Santiago, Belle Vista, Otuyo, Quillacas, San Juan, Capura and more – I have captured the hopes, dream and fears of the women, and some men, of these communities. “What is sustainability for a woman quinoa farmer?” is the question all were asked. In 90 minute meetings in stark, crumbling adobe town meeting halls with creaky, oiled, wooden floors, we would mull over this – under the light of a few florescent bulbs tacked up to the ceilings made of sewn flour sacks. Often at 8 or 9 at night, once the women had returned from the quinoa fields, cooked dinner, attended to their children and finally had a moment to spare to meet a foreigner from the US, who had actually travelled all the way to her community and was interested in learning about her well-being and listening to her voice. Me, the author, interviewing a quinoa farmer from San Juan. Most times, I would be introduced to the elected town authority by the woman member of a quinoa growers’ cooperative or association who took me under her wing, let me stay with her family, visit and work in her fields, cook and eat her food, ask a million questions and get to know the community better. I would offer the community an interactive workshop and the elected town crier would ring the church bell in the community, letting the people know there was a meeting. Women would arrive from the dark street wrapped in shawls and ponchos, long layered skirts and thick stockings. Even though it was the Andean summer, nighttime temperatures would drop into the 50 and 40s and our drafty meeting houses did not have heat. The meetings began with participants in a semi-circle facing the wall where I had a large sheet of paper tacked up with my name, cell phone number, e-mail and the title of the workshop. Transparency was important and giving out one’s cell phone number is like offering a handshake here. I would be presented to the group by the village official and would then further introduce myself as a US professor of Solidarity Economy, a concept well known in South America, that refers to an economy of working together in a mutually beneficial way for all. (There are a handful of “solidarity economists” in the US, mostly lumped under the title of “radical economists” and teaching in areas such as environmental economics and political economy). Felix and his family take a break from hand hoeing their highland quinoa fields in Lluvica. In the Andean tradition, I would then invite the participants to a snack – this time it was a Kind bar, made by a New York company who prides themselves on using visible ingredients so participants could see the tiny puffed quinoas that were part of the chocolate-honey-oatmeal-millet bar. It was interesting for them to experience how others use their quinoa and all loved the sweet, chewy bars. 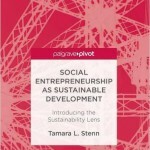 We then launched into a group discussion of what was sustainability to them. I would start by drawing a wiggly line on a piece of paper signifying the earth, to give them a starting point. Then little by little other details would be added: rain, money, quinoa, llamas, manure, people – usually in that order. I would draw and label each item as they mentioned it – learning from my friend Tito Medrano from the Fair Trade NGO, that people responded better to drawings than written words which they were unaccustomed to using. After about 20 minutes of open conversation, I would put a positive and a negative sign in a space I had left open on the paper, dividing that section in half, and introduce the Talking Stick – a native American way of inviting all people to speak equally about a topic. In the Andean tradition, things are talked about in balance – there is always a positive and negative to each situation and this is valued in conversation. The participants would take turns holding the stick (passed from left to right) and adding their own ideas or re-enforcing other ideas already presented, about what they saw as the positive and negative aspects of their own sustainability and quinoa production. The talking stick helped to even out the opening conversation which was usually dominated by a few people, and bring out the more quiet people, often the oldest and youngest women, to talk. As things were repeated, I would put a check next to the item. As new things were mentioned, they were added to the picture and the -/+ part of the paper. Often jokes would be made and there would be a serious, but also playful, tone to the meeting. By the end of the workshop, we had a pretty good idea of the needs, fears, and hopes of the people in that community. Participants reported they enjoyed that moment to reflect together over who they were and where they were in their own lives and that of the community. I would leave the posters hung up for people to reference later, taking a photo for my own records. What quinoa farmers need for sustainable living. What emerged was something unique and universal at once. While each community had their own interpretation of sustainability, after six meetings with almost 100 people, 60% who were women, common themes began to emerge with varying degrees of urgency and need. The following is a quantified presentation of the six most popular themes and the negative-positive aspects of them. The numbers represent the number of times the theme was mentioned by meeting participants. The negative-posititve contrasts to each theme. The most important theme was the climate. With climate change making farming more risky and unpredictable with early frosts, sudden hail, torrential downpours and long droughts, farmers no longer could predict harvests or calculate optimal planting times like before. After years of drought, which just ended with abundant rains this January, landscapes had changed – there was not as much forage for the llamas and wild vicunas and delicate topsoils were being carried away in the winds. The positive aspect of the climate was the rain which had arrived and the ability to grow quinoa though the negative was the unpredictable weather which could wipe out an entire crop of quinoa. After climate came the people. 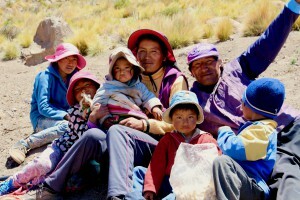 People were pleased to be working together as an entire family in the quinoa soil prep, planting and harvest. Many children were home from college and visiting from Chile where families had migrated in search of better work – helping with the quinoa and llamas. However there was a lot of recognition that the Bolivian quinoa was largely hand grown in small quantities with the utmost care and quality, the earth and seeds were blessed before planting and for the harvest. This took a lot of work. Weeks are spent in the acres of fields hand hoeing weeds and hilling up fallen quinoa stalks, hand picking off worms, turning over soils, cutting and drying the large seed heads – one head at a time, separating the seeds from the stalks, cleaning out stones, loosening the chafe. Women had the extra work of cooking and child care on top of this. For the Bolivian kitchen, there was also a lot of processing of the quinoa at home. The seeds needed to be toasted and the chafe removed by sifting it in the wind, then the seed was washed several times – often toasted again for pisaga or hand ground into pito – where it was used to make a drink, dumplings, or eaten plain with a small amount of sugar. The seed was a culture, a source of pride that the Bolivians themselves cultivated since ancient times. There were legends, stories and a long shared memory of quinoa – the seed of gold, the plant that is central to the Andean culture and identity – much like corn is for native Americans in the north. However the people were dictated the price for their quinoa by the Peruvian market, which with government investment and mechanized, large scale farming, was outpricing the more artisanal Bolivian quinoa. The price of 450Bs a quintal for top quality, organic Bolivian quinoa was not meeting the small scale Bolivian farmer’s costs. Also needed for sustainability was the quinoa itself. 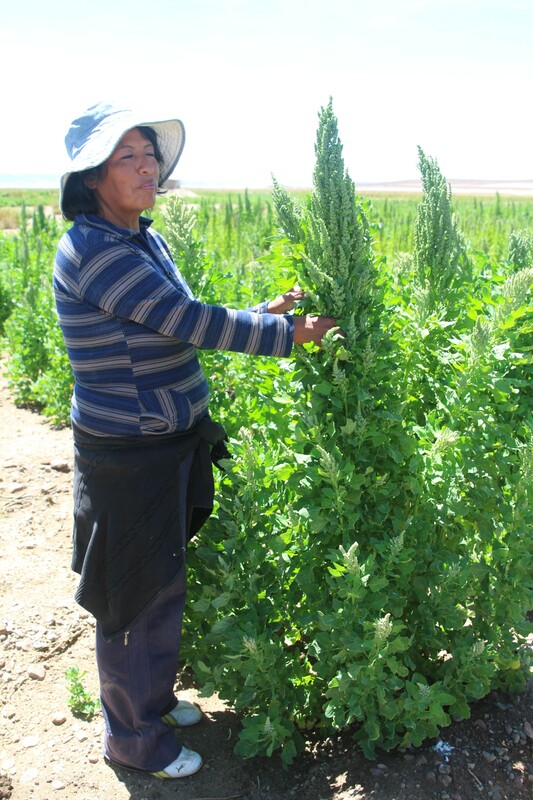 The positive aspects were the presence of the Quinoa Real, a type of quinoa that only grew in the mineral rich, sandy soils surrounding the Bolivian salt flats and the traditional organic style of farming. The negative parts were the lack of organic pest control methods, the increasingly problematic worms eating the seed heads, a lack of investment for proper farm inputs – such as ample fertilizer (organic llama manure), and preventative pest control (such as moth traps) –the over tilling of the delicate land by tractors better suited for the deep soils of the valleys, the clearing of native grasses for more quinoa production – which led to increased desertification and loss of grazing lands, the thousands of acres of abandoned quinoa lands, now tilled and barren, the fact that Bolivians cannot compete with modern mechanized world production methods of quinoa – where there are 2 harvests, deep soils, rain and ample investment, and that there is no recognition of the quality and work that goes into their quinoa and its thousands of varieties that are known to the world only as white, red, black. The earth itself (soils) are also mentioned many times in the theme of sustainability – with recognition of its microorganisms, organic nature, mineral content and that it is a respected, living organism, the Earth Mother (Pachamama) who supports all life. There was recognition of its need to be respected, not exploited, and cared for carefully without massive production, but with high quality, small scale, organic artisanal farming. The animals were also of importance to the people – largely the llamas, which were native to the altiplano and were raised in balance with the quinoa. Alpaca dung is still the fertilizer of choice for the Bolivian quinoa. 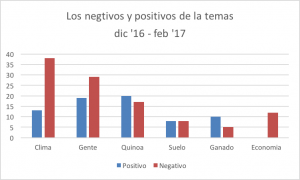 The positive was the presence of the llama though the negative was the toll the drought and loss of forage for the animals due to excessive clearing and tilling of altiplano lands – herds were smaller, animals thin and some did not have the energy to nurse their babies. In addition, due to the extreme drop in quinoa prices, many people have left the quinoa regions in search of more steady work, and no longer maintain their own herds of alpaca – though they still return to plant and harvest the quinoa. Alpaca dung is now at a premium, as there is less now than before for use in the quinoa fields and many families have to purchase dung since they no longer have their herds to provide this for them. Finally the economy itself was problematic. There was nothing good to be said about this. The current market price of quinoa – including fair trade and organic – simply did not cover the costs of production. 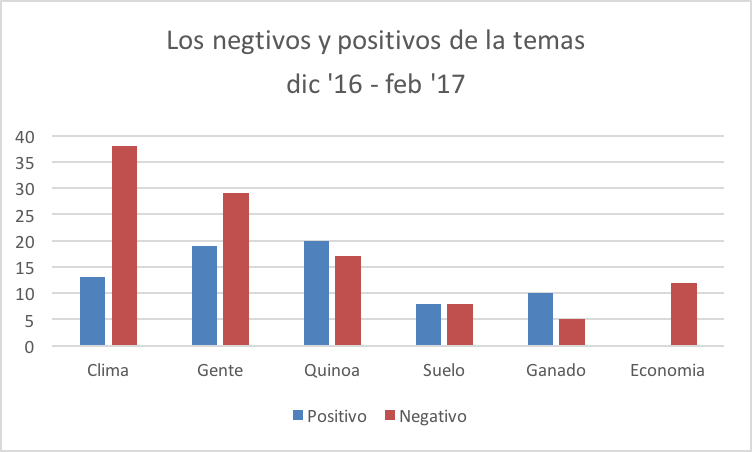 Dictated from Peru and pushed by foreign competition, the Bolivian quinoa farmers had no control on pricing of their product. They had the choice to accept the market price which ranged from 550Bs (7Bs is $1US) for a quintal of quinoa to 250Bs for common market uncertified quinoa – or not sell the product at all, and save it for their own use. Quinoa farmers however, were just that. 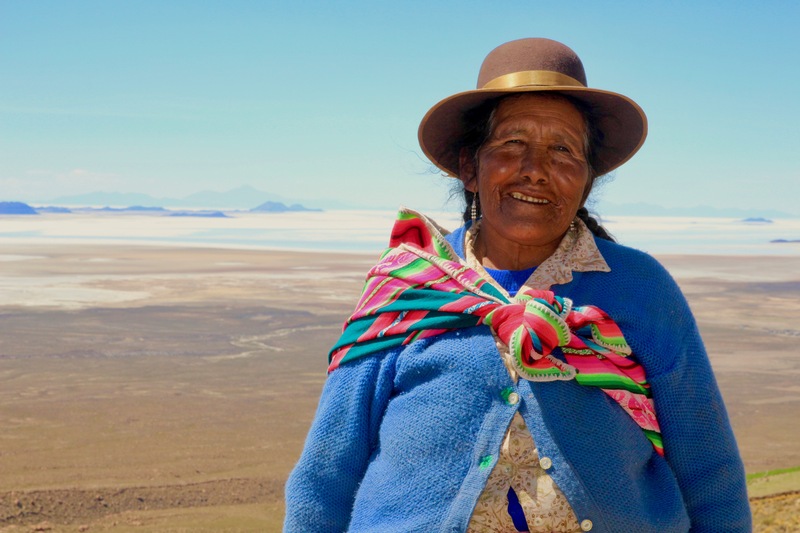 In the cold, arid altiplano, very few other crops grew – some produced a few pounds of potatoes, fava beans and onions for their own use, but not in quantities for market sales. The llama meat fetched a fair market price, but the market for alpaca meat was largely limited to national sales in the highlands where there was a tradition of consuming llama. So while largely self-sufficient farmers, quinoa growers also had a need for cash – to pay for electricity, to buy cooking oil, clothes, school supplies, and to grow the quinoa – pay for the tractor to till the soil, manure, pest control and labor. Current prices are at half of what the farmers need for a dignified living and the is no sign of the prices changing any time in the near future. 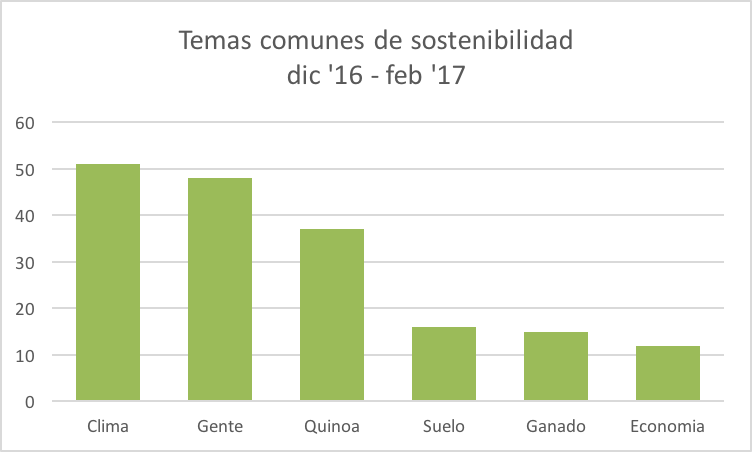 As a result, less land is being planted, leading to less income as well, and increased migration out of the quinoa zone. Most communities only have 25% of the families living there full time – the rest are in other cities such as Oruro, Potosi, Cochabamba, Santa Cruz and La Paz and countries such as Chile, working in urban jobs. Overall, there were 13 different themes mentioned with three being outliers (for example – the wild animals of the mountains, or the abundant crops and recipes of the valleys) which were specific to a particular community and did not represent the ideas of all quinoa growers. Additional themes mentioned with less frequency included culture, wisdom, policy and tourism. Galdys shows off her community quinoa in Chuvica. My thanks go out to Gladys Caral, Monica Cayo, Florinda Consales, and Ester Mamani for helping to make this study happen, and for bringing me into their lives. We will continue to work together via the internet and WhatsApp until I return again in 2018 – keeping the connection open between the remote quinoa lands, US markets, and academic classrooms.